“When you ain’t got nothing, you got nothing to lose”. Two millions Dollars was the sum an anonymous businessman gladly paid for the four pages original manuscript of the song “Like a Rolling Stone”. Indeed irony is one way to describe Bob Dylan’s career, the poet who wrote this complex beautiful poem when he was only 24 years old. The Dylan who was crowned by the hippies as the guru of rock ‘n’ roll and turned his back on both the title and the congregation; the same Dylan who used to change his musical style just when the fans started to like it; the same Dylan whose Jewish parents – Abraham Zimmerman and Beatty Stone, descendants of Eastern European immigrants – gave him the name Shabtai Zisl; the same Dylan who converted to Christianity three decades later in front of the cameras, and then returned to Judaism and flirted with CHABAD. The elusive Dylan: protest, troubadour, wanderer, activist, individualist – and also the rude laureate who would not answer the call from the Nobel Prize committee nor come to receive the prestigious prize due to “having other engagements”. Dylan, the greatest Jewish singer song writer of all times, the man born “with a snake in both of your fists while a hurricane was blowing”, the profound lyricist whose words penetrate deep inside your soul, where no psychologist can go – was one of these few fortunate people whom God not only touched, but actually cleared his schedule in order to give them his full attention. In a world that worships multi identities, Bob Dylan is a role model – which he resents the most. In a culture of fake news, alternative facts, over representation, and post truth – it’s nice to have out there a Jewish guy with a guitar or harmonica wearing a cowboy’s hat, hearing with who knows-how-many-ears to the people cry. Dylan is considered an artist who expanded popular music themes way beyond “boy meet girl” themes, reaching the realms of politics, philosophy and absurdity. He uses puns and double meaning a lot, therefore referred to as a poet, not a song writer. He re-established new forms in American music, drawing from the folk, country, blues, and rock traditions, and even Jazz and swing. Though aging, 76 years old Dylan never fails to find new heaven’s doors to knock upon, turning each time his back on the old ones. His poems mention God, the bible, the New Testament, sometimes he is a believer and sometimes a heresy, but always with great admiration to traditions. He is fascinated with apocalyptic parts of the biblical literature, about the end of all times. It seems that most of all, Dylan is looking for redemption. In the past 18 months Beit Hatfutsot – the Museum of the Jewish People – proudly displayed an exhibition dedicated to this great musician, one of the forefathers of Rock’n’roll, whom the Times Magazine included in “100 Persons of The Century” list of 1999. The exhibition presented his elusive personality through clips, films, photos, images, exhibits, and lots of music. 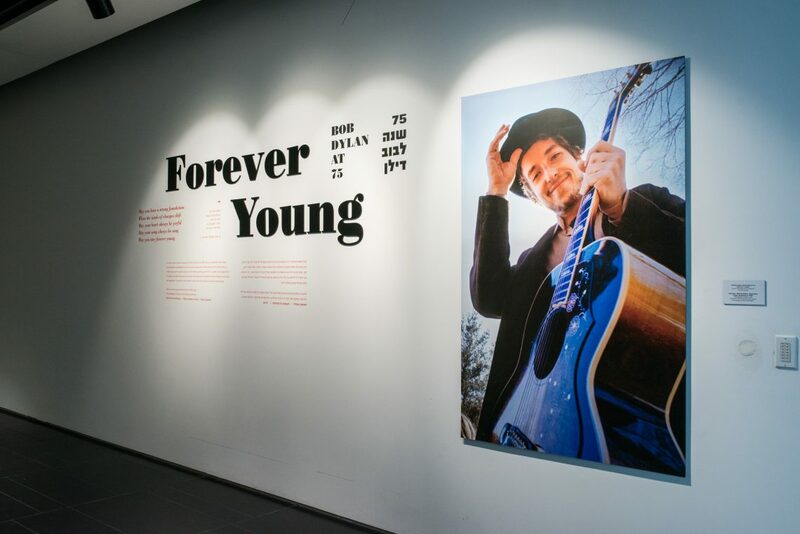 It was a unique exhibition, not arranged chronologically but rather thematically, examining three main themes: Dylan the revolutionary; Dylan and his impact on world music; Dylan the Jew. So until we meet again, god bless you Bob Dylan – forever young.